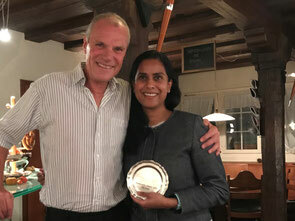 On Saturday 18th November 2017 members of the Winterthur Cricket Club, family members & friends, attended the End Of Season Awards Dinner held at the Taverne zum Kreuz in Winterthur. WCC vice-President, Alex Mackay, welcomed everyone to the WCC's 2017 End of Season Awards Dinner, afterwhich members enjoyed a superb four course menu prepared and served by Ueli Hack & his team. Between the main-course & dessert, the club President, John Hallam, spoke of the season passed, with a particular mention to Tom Mampilly who was standing down as captain at the end of the year. John Hallam then went on to award the President's Award to Juli Pratt for her work with the team, in particular her pre-match fitness routines and physio role. 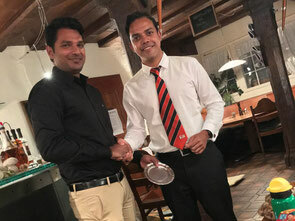 Club captain, Tom Mampilly, spoke of a disappointing season with regards to results but pointed out some of the highlights, not least the strong back-bone to the club, one of the oldest in Switzerland, with its many good traditions most commonly found in clubs from countries with more traditional cricketing backgrounds. 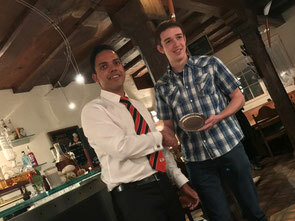 Tom then proceeded to award Ruan Kruger with the best batsman and Shijo Joseph with the best bowler award. Lastly, social secretary, Vinny Patel thanked everyone for their support and spoke of new ways he hoped to find to attract more members to such social events next season. For more information on the club's 2017 End of Season Awards Dinner is available from Vinny Patel. Photographs can be viewed in the website gallery. You can also read the list of past award winners.